Getting down into the city was pretty simple. My train line was a straight shot from departure to destination, and we were able to snag a spot in the station parking lot instead of having to park a distance away at the local mall. (Shout out to the amazing officer who let us know about the open spots!) Surprisingly, the lot and the train were pretty empty with next to no chaos during boarding or the ride. Even, when we reached our destination, things were pretty calm and the crowd was relatively thin for what I had been expecting at the event. 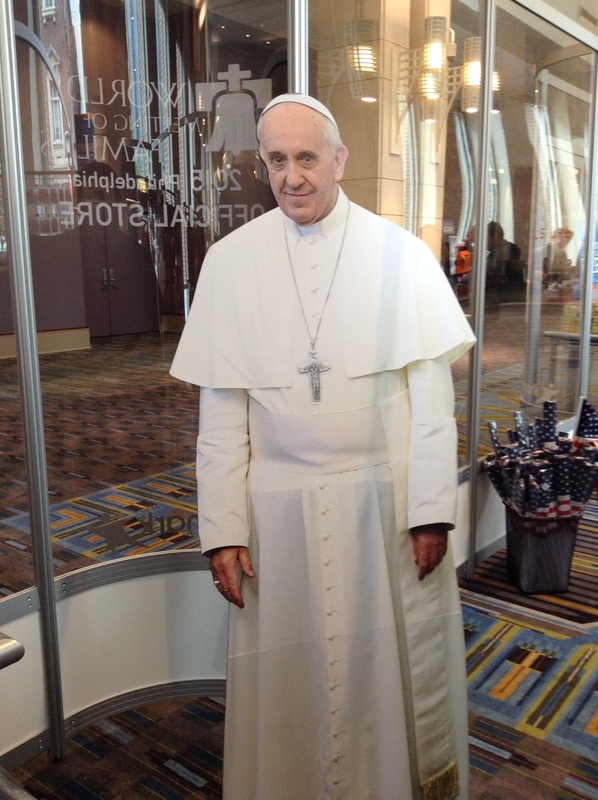 After making stop at the World Meeting of Families official store and taking a few snapshots with a life-size cardboard cutout of Pope Francis, we made our journey through the Center City streets towards the Benjamin Franklin Parkway. Once we got through the main security checkpoint that allowed visitors to access the zone that didn’t require tickets, we were thrust right into the heart of the action. I took in the festival-like atmosphere as we made our way down through Love Park. 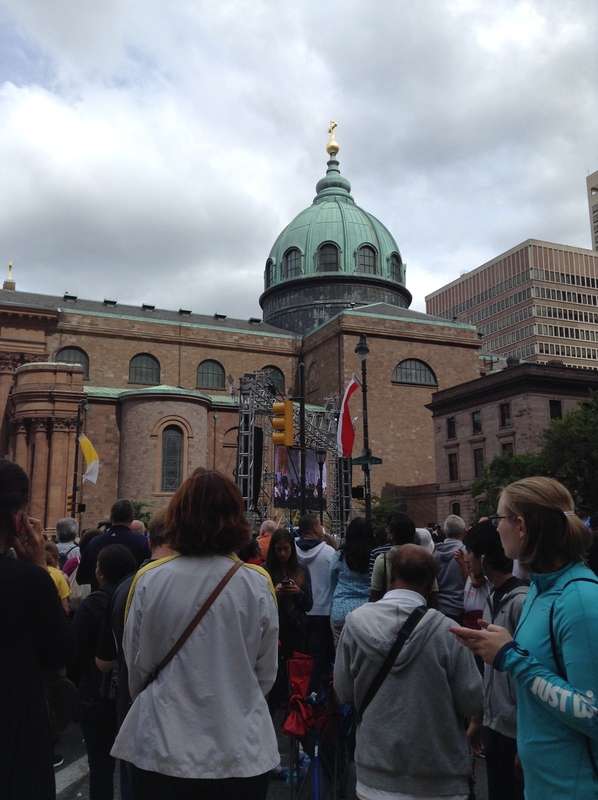 The streets were lined with food trucks, souvenir stands, and people from all walks of life hoping to catch a glimpse of the Pope. Even the guy know as Philly Jesus was in attendance. (I’ll admit I was fascinated to see him in person. I didn’t even know he was still around.) 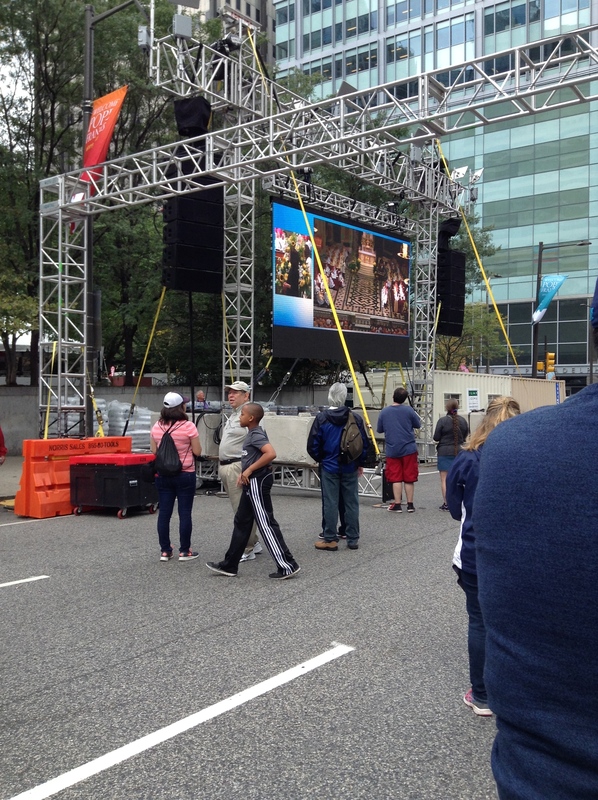 The city even set up jumbotrons at various corners so those who were unable to get into the ticketed events or near the open events could still be a part of the action. We reached our destination as the mass at the Basilica of Saints Peter and Paul was ending. 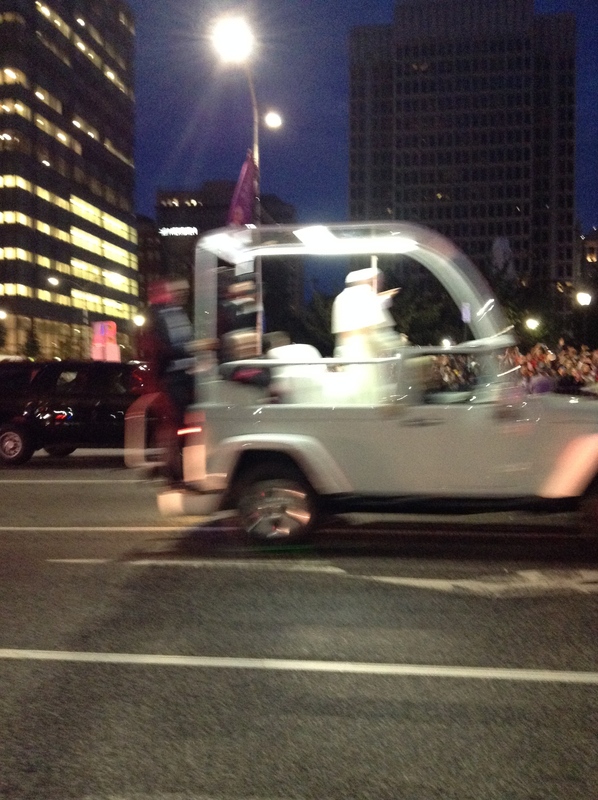 Word came that Pope Francis would be coming down the street, so we all gathered at the barrier to catch a glimpse of him. While I waited, I chatted with some girls around my age of how how cute we thought the Secret Service guys were as we stood on the steps of one of the high-rise apartment buildings. However, it ended up being a false report. We me up with some family friends and killed time at an Irish bar for a couple hours. (Yay, for real bathrooms and a place to sit!) We had heard from fellow crowd members that there were rumors Pope Francis would be making an appearance again, so we made our way to back to the barricade a little after 3:00 for the possible parade at 4:00. We lucked out and snagged a spot right up against the barricade, but, once again, this was a false alarm. As we stood around waiting for the official parade at 7:00, we struck up a conversation with a family of women who were in town for the event. They spanned the country with one from Nashville, one from Chicago, one from New York, one from Philadelphia, and two from Indianapolis. The trip was a Christmas gift for their mother who was well into her seventies. She and one of her daughter’s mother-in-laws (also around the same age) were absolute troopers refusing to leave their prime spots to even sit down. It was so much fun seeing these two women in their seventies so excited to see the Pope. When we learned they hadn’t been able to secure any passes to later events, we gave them ours, which earned us a big hug, promises of prayers and some happy tears from their mother. We even took a big group picture with them. Then, the real waiting began. The rest of the night was spent fight through crowds to get back to our train station followed by an over an hour wait for our train trading stories with some workers from SEPTA. One of them proudly wore a Pope blessed rosary around his neck, a gift from a Hawaiian passenger he had assisted earlier in the day. Overall, the day was very exciting, I’m blessed to have been able to have been a part of it. 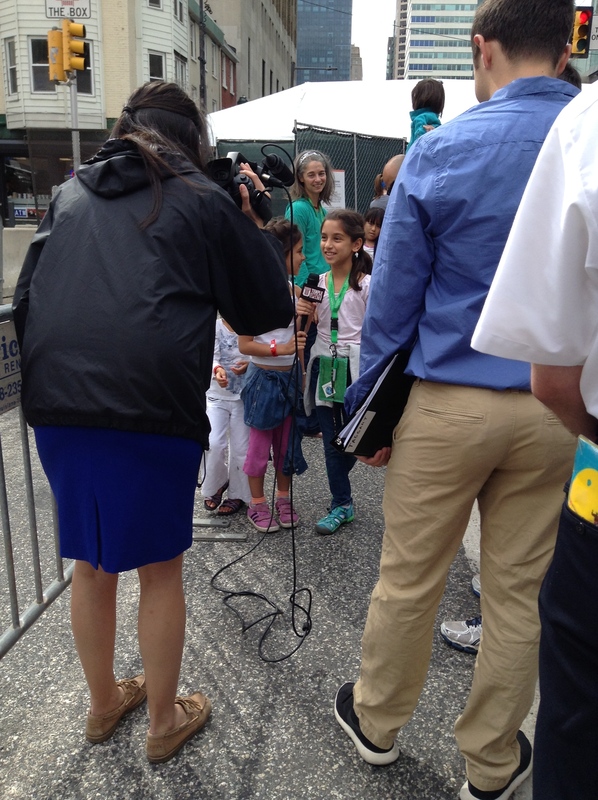 I want to express my gratitude to all the volunteers, law enforcement officials, and SEPTA workers who made the event happen. Everyone was so kind and helpful, which made everything go much more smoothly and made the long periods of waiting more tolerable. Every question and request for assistance was met with a smile. Even thought the hours were long, both event workers and attendees remained in high spirits. It was amazing to see people of all ages from all walks of life come to together to celebrate their faith and the Church and to be in the presence of Pope Francis. This truly was one of those vents in my life I will always remember. Will Write For Boots Is Now on Facebook! I so excited to announce that Will Write For Boots now has a Facebook page. Starting today, I’ll be posting links on the page to everything I post on here. (Since we’re only eleven days into 101 Days of Words of Wisdom, I’ll be posting links to all previous posts in this series.) I can’t wait to connect with those of you who prefer to use Facebook over Twitter as your main social media platform. You can like the blog by clicking on the button on the sidebar or visit the page directly by clicking here. Come check it out! National Wear Red Day Is February 6th: Who Will You Go Red For? The color red, hearts and the month of February go to together like graham crackers, chocolate and marshmallows go together to create s’mores. While you may typically think of Valentine’ Day, Go Red for Women, an organization created by the American Heart Association, wants you to associate red, hearts and February with women’s heart health this Friday with its annual National Wear Red Day. 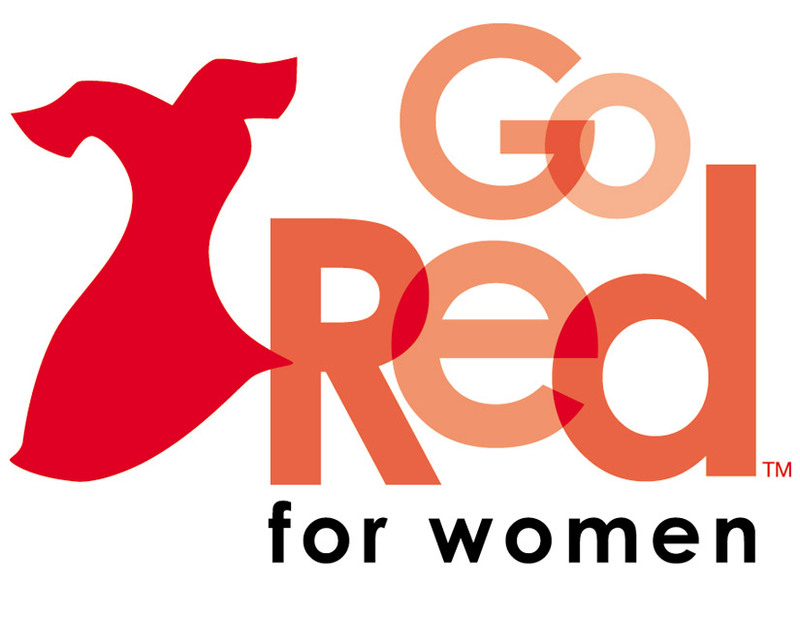 Fact: According to the Go Red For Women website, one out of three women dies from heart disease or stroke every year. However, through lifestyle changes and education, eighty percent of these instances can be prevented. National Wear Red Day encourages everyone to wear red to raise awareness among women to learn about heart health and to change the stereotype that heart disease is a man’s issue. Many places also host fundraisers, distribute literature, and give free blood pressure checks for those who want to get their numbers checked. I first learned about National Wear Red Day a few years ago when I was working at Mignoni Jewelry in my hometown of Bristol, PA. Organized by Theresa Conejo, the National Wear Red Day event Mill Street Goes Red has become a Bristol staple. Every February, merchants, residents and patrons of Mill Street show their support for the cause by sport red outfits, creating red window displays and offering special promotions and events throughout the day. This year’s Mill Street Goes Red event holds a special meaning for me this year as Mill Street Goes Red is being held in honor of my wonderful cousin Ann Mignoni Mundy. Ann, who passed away suddenly this past Thanksgiving, owned Mignoni Jewelry with her sisters and was a longtime supporter of Go Red For Women. While I won’t be able to make it to Mill Street in person, I will be wearing my red to work in honor of her memory and National Wear Red Day. So this Friday, I encourage you to throw on some red, whether it be your favorite dress, a bold statement necklace, a killer lip color or whatever else you can think of to help spread the message of women’s heart health. When someone compliments you on your ensemble, take a minute to tell them about National Go Red Day. If you happen to be in Bristol, PA, stop down to Mill Street and join in on all the fun of Mill Street Goes Red. (Also, check out your community boards and websites for National Wear Red Day events in your area.) You can even join in the conversation on social media by posting your Go Red photos with the hashtags #GoRed, #GoRedSelfie and, for Bristol, PA participants, #MillStreetGoesRed. Who will you go red for on Friday? For more information on this year’s Mill Street Goes Red, including events and business promotions, check out the event’s Facebook page. For more information on heart disease and prevention, please visit GoRedForWomen.org.